Dane Swan, seen playing for Williamstown in 2002, was a member of Willy's 2003 premiership team in only his second season on Collingwood's list. Williamstown will celebrate the 10th anniversary of its dual 2003 VFL Premiership triumphs at a pre-match luncheon before hosting Collingwood in round five of the state competition at Burbank Oval on Sunday. The win came in the Seagulls third year aligned with the Magpies with Collingwood assistant coach Brad Gotch in his second year in charge. Signalling the end of 13 years in the VFL wilderness, Williamstown’s triumph completed a remarkable turn in fortunes for the side from Point Gellibrand, having emerged from a winless 1995 campaign fighting for survival. With new management assuming control the following year, Williamstown commenced a long march back to the VFL summit, making two finals appearances before the breakthrough Premiership. 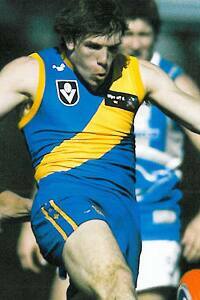 “The club had been in trouble in 1995, and hadn’t won a game,” Williamstown Chief Executive Officer Brendan Curry said. Indeed, while the success marked the Seagulls 13th flag at VFA/VFL level, the victory carried a distinct Black and White hue, with the side featuring a litany of Collingwood listed players. Captain Nick Maxwell and 2010 Brownlow Medallist Dane Swan were among the notable Magpies to feature on the day, in addition to the likes of 2002 AFL Grand Final veterans Rupert Betheras, Steven McKee, Jarrod Molloy and Glenn Freeborn. While the group failed to feature in the AFL Grand Final the following week, one individual was on target to complete a rather unique double, as Tristan Walker, starting at Centre Half Back for the Seagulls, earned a call-up to replace Anthony Rocca for that fateful last day in September. The zenith of Collingwood’s alignment with the VFL giants, the club’s parted ways in 2007, with the Magpies establishing a stand-alone outfit. However, Williamstown’s influence endured, the side later returning the favour in 2010 as a number of Magpies who honed their talent within the confines of Burbank Oval helping bring Premiership glory back to Collingwood for the first time since, coincidentally, 1990. Maxwell and Swan will join a host of Seagulls Premiership heroes to return for the celebration, with former Magpies Walker, Mark Richardson and Andrew Walker set to also be in the audience. Tickets for the luncheon are still available for $60, and feature a two-course meal with drinks inclusive. To book, please call Williamstown on 9391 0309 or by emailing bcurry@williamstownfc.com.au.